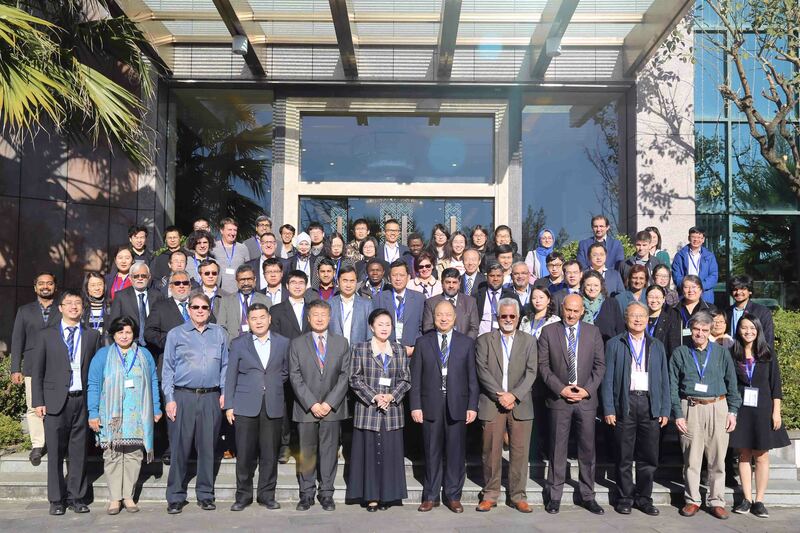 The Annual DBAR Science Team Meeting was convened in Tengchong City, Yunnan Province of China. Prof. GUO Huadong the Chair of the DBAR Science Committee chaired the meeting to overview the progress of 7 Working Groups, 2 Task Forces and 8 International Centers of Excellence. The meeting was attended by over 90 experts, representing 28 countries from all major continents. GUO Huadong welcomed all to the small but beautiful and peaceful city of Tengchong and emphasized on the importance of the meeting as it was the last meeting before the second Phase of DBAR. He expressed satisfaction on the progress, as DBAR progressed well against all of its targets during the preparatory phase including development of Science Committee, establishment of an organized Secretariat, and formal inauguration of 6 of the 8 ICoEs planned, in addition to establishing 7 Working Groups and 2 Task Forces. He also informed the members that the DBAR will launch the DBAR Big Earth Data Platform during the opening ceremony of the 3rdDigital Belt and Road Conference on the 5th of December， 2018. Ms. LIU Jie, DBAR Secretary-General, inform all that DBAR has also been included in the CASEarth project, a Strategic CAS Project, and expressed that DBAR will continue to develop collaborative partnerships through pilot projects, develop linkages, and networking. She stressed that DBAR needs to identify its value and uniqueness through real examples. Prof. Massimo Menenti, DBAR Science Committee Member, in his presentation introduce the importance and objectives of an evaluation process, and presented the proposed DBAR Evaluation Plan, to carry out external evaluation of the first phase of DBAR Science Plan, highlighting the key points of his proposal to DBAR’s Science Committee for review and approval. The key component of the meeting was the progress reports presented by the Co-Chairs of all Working Groups, Task Forces and International Centers of Excellence. The reports focused on capacity develop and outreach, networking and partnership efforts, establish networks and partnerships, ongoing research activities and projects, publications, data/information products and deliverables, funding sources and outreach efforts including workshops, training, conferences and sessions. They also briefed on identified future targets specifically for the year 2019. DBAR-DISASTER Working Group, and DBAR ICoE-Bangkok were evaluated to have performed the best by the Science Committee based on the progress reported during the meeting. The meeting also had discussions on the identifying key action plan for 2019. The meeting concluded by GUO Huadong thanking all members for their support, hard work and hoped for the same in the future. He reiterated that DBAR is striving to develop an information system capable of aggregating, representing, manipulating and analyzing data to aid national and regional policy development and management practices, especially to facilitate efforts towards sustainable development goals. He stressed that data sharing is the key to making the DBAR Big Earth Data Platform a success and efforts of experts are critical to deliver methodologies and best practices for Big Earth Data and DBAR data portal utility. He hoped that the different units of DBAR will continue their efforts to making this program a success.